Saturday Morning Cartoons is back this week, bringing you a Mojo-rrific episode of Avengers Assemble, a baby shower from an episode of Archer that aired earlier in the week, and the season finale of Defenders of Berk. If you miss Clone Wars, don't forget to check out the Netflix exclusive season six offering. My Little Pony: Friendship is Magic - "Somepony to Watch Over Me"
Ever tire of looking after a younger sibling? Applejack does. This week Applejack gives Apple Bloom the chance to stay home by herself for the day...will Applejack regret the decision? Personal aside, this episode's title made me audibly groan. Defenders of Berk - "Cast Out, Part II"
It's the season finale of Berk! Stoick has been captured by Dagur, but this dire situation lends a little heat to the cold war as Alvin and Hiccup join forces for Stoick's rescue and to do battle against the Berserkers and Screaming Death on Outcast Island. Archer is on the hunt for an over the top gift for Lana's baby shower, a hunt that leads him to Kenny Loggins' door. This clip shows a portion of the shower, book-ended by a rousing rendition of "Danger Zone." Language in this clip may be NSFW. Adventure Time - "Bad Timing"
This week's episode is a bit odd, even for Adventure Time. Princess Bubblegum creates a set of power gloves with limited time travel ability, arousing Lumpy Space Princess' desire to use the tech to reunite herself with Brad. There are multiple animated viewing frames for the episode, with the storyline taking place only within a circular portion on the screen. 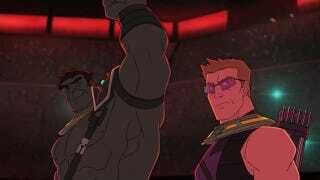 Hawkeye are Hulk are forced to fight in the Mojoverse...but will the pair have to fight each other? Mojo is in full Jabba the Hutt mode in this clip, eating some live bait from a bucket. Check out the crowd shots for a few interesting cameos. Anybody else hoping for a Longshot or Shatterstar appearance? Top image is courtesy of Marvel/DisneyXD.